Are you on looking for an all natural toothpaste that works? 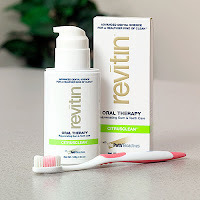 I was too until I was approached by Revitin to do a review on their all natural Oral Therapy Paste in citrus flavor. Unlike others, (most of which have a poison warning on the label), eek! Revitin is safe enough to ingest and contains no harsh detergents or chemicals. But to my surprise, it actually tasted better then any paste I've tried and works better too because it's not a toothpaste, but an oral therapy paste. A natural therapeutic product that makes you rethink ordinary toothpaste and the products we use for oral health. Revitin Oral Therapy gently cleans, enhances and beautifies your smile with a natural blend of antioxidants, vitamins and minerals. It doesn't contain any chemicals, detergents or additives, or artificial colors, sweeteners dyes, peroxide or Sodium Lauryl Sulfate (SLS). It promotes clean breath, helps tired, damaged gums (periodontitis) - reduces red, swollen gums, restores gum's firmness, helps prevent canker sores, removes stains, leaving a bright clean shine while reducing harmful plaque. Revitin works with the natural defenses in the mouth. It acts like a smart toothpaste that respects and works with the natural ecology of the mouth and the needs of the cells, not stripping away the good bacteria like many other brands do. What's more it leaves a fresh, citrus taste that's actually pleasant and doesn't burn or irritate my mouth at all. I noticed I wasn't rushing to rinse with cold water from the burning like with my regular toothpaste. Fresh breath actually lasts longer then regular toothpaste too. Revitin retails for $21.95 and you can purchase it on their website at www.revitin.com. And they've offered my readers a $2.00 off coupon just for you to try it! Just go to https://www.revitin.com/buy-revitin.html and use coupon code (Revitin757) at checkout. You can check out customer testimonials here, and follow them on their Twitter and Facebook pages too.